"Our mission is to develop and promote best practice franchising in Ireland and to create an environment within which franchised businesses can grow." When John Green took up the mantle of Irish Franchise Association (IFA) Chairman in 1998, having been involved with ChemDry for 10 years, franchising in Ireland was still in its infancy. 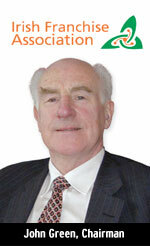 Only a handful of franchise systems were operational and the IFA had lost direction following the death of its Founder John Neenan. Green recalls McDonald's, The Body Shop, and Tie Rack as being among the international brands making inroads into Ireland. Abrakababra, a takeaway restaurant concept, was one of the few indigenous franchises. Having invested in the ChemDry Master Franchise for Ireland in 1989, Green entered franchising on the brink of an exciting growth curve. The 1990s marked a new developmental phase for Ireland and its franchise sector, peaking in early 2000. As the economy dipped following a global economic slowdown, the growth of franchising also slowed but didn't stop. When the first survey of franchising in Ireland was conducted in 1995 the turnover of franchise systems in Ireland was €0.256 billion. In 2001 turnover was €1.02 billion, a record 79 per cent growth on the previous year. The last survey conducted in 2004 by Franchise Direct recorded 201 business format franchise systems generating a group turnover of €1.272 billion*. The 2006 Franchising in Ireland Survey, due to be published later this year, is expected to reveal further growth with an estimated 250 business format systems. Green upholds the values of the association in his ChemDry franchise by ensuring franchisees receive periodic training updates and are always kept up to date on what's new and are aware of the group's ethical practices. 'Our 42 ChemDry franchisees are a great group of people who always go the extra mile for customers,' Green adds. Within the next two years, the association is aiming to double its membership base of 73 and to introduce categories of membership similar to its UK counterpart the British Franchise Association. Each year the IFA runs a series of events to educate and promote franchising. Events remaining for 2006 include the Irish Franchise Exhibition being held in Dublin on November 17th and 18th organised by Venture Marketing Group. Coinciding with the exhibition is a franchisor training programme focusing on recruiting and motivating franchisees, and the annual awards dinner. The final 'Franchise Your Business' seminar is scheduled for October 3rd and is sponsored by the Bank of Ireland. Also running in October is the 'Franchising all you need to know' seminar, sponsored by Ulster Bank on the 4th and in Carlow on the 12th October.